Patience, do you have it? My husband and I just returned home after a weekend away, just the two of us. While we were gone, my mother watched “G”. 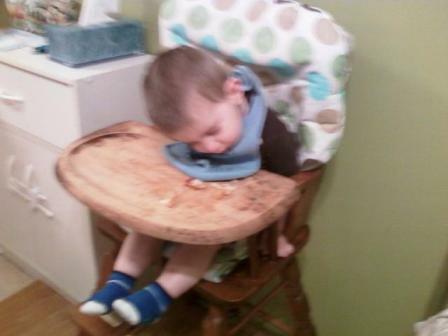 It was during this time, she discovered he has a new talent: sleeping in his high chair while eating lunch. 2 Responses to "Lunch time nap"
That is the best. The absolute best.